Endless webbing sling is the economical & adaptable sling with no fixed wear points,which can be moved to increase sling life. We could product single and multi-ply webbing sling according to the requirement from the customers.The safety factor from 6:1to 7:1 is available. And these products is according to EN1492-1,complied with GS&CE. 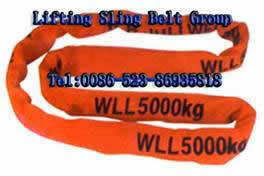 Customers could choice special length based on special requirement.